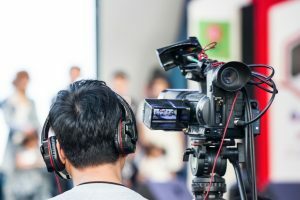 Why Do Business Owners Need To Consider Video in 2019? People Want To Learn Fast, So Help Them! 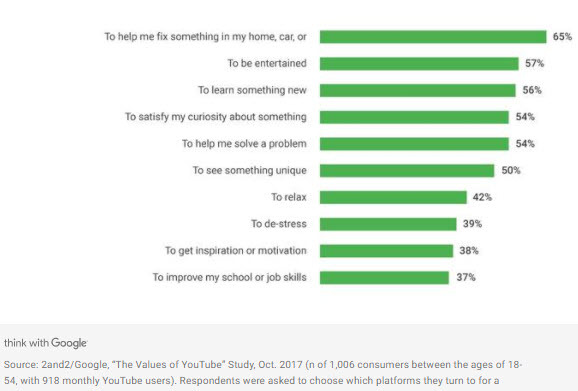 According to the study, 7 in 10 people turn to YouTube in order to help themselves with a problem. It’s for their work, their school or studies and also for general hobbies. Better yet, 86% said they turn to YouTube to learn something completely new. That’s right! ‘ How- to content ‘ actually gathers more attention than anything else on YouTube, including even music and gaming. How Might Different Types of Business Use ‘How To Video’ To Draw New Leads? > How I go about getting qualified for a mortgage? > What does it cost per square foot to build a home in my town? > When is it time to re- build a driveway? > How would I really know if my home has mold? > How much per incident auto coverage should I have, at minimum? The point is demonstrating a knowledge of highly specific subjects in video that prospects are searching for and, in doing so, branding oneself = the business as the authoritative helpful professional for those same prospects to chose! Folks the more useful your how- to video the more likely you will capture qualified leads! Social media platforms allow even the smallest business to advertise video commercials online to a potentially massive audience and without breaking the budget! That plus a share-friendly environment, where video can be viewed and then shared to friends easily, offers a revolutionary opportunity. Here are some tips for creating compelling video commercials. Businesses typically use either promotional video or a commercial, and there is a difference between the two. Promotional videos are often more lengthy, possibly with detailed explanations for a product or service. They act more as a showcase for a brand’s offerings. A commercial is more likely meant to establish a brand in a memorable way, without being too long or cinematic. Promotional videos can work well for specific initiatives like maybe a specific product launch; whereas, a commercial might be a unique and interactive way to introduce a brand to a target audience. Commercials are often used to drive traffic, maybe to raise brand awareness and/ or expand reach with new prospects. Who is this commercial for? What problem does the subject solve? What is the a call-to-action? And remember that while commercial video may be brief, pertinent information should still keep an audience interested while getting the point across! YouTube, Facebook & Instagram offer great options for advertising with video content. In fact Facebook ads can be integrated with Instagram to reach an even larger audience. YouTube charges advertisers when their entire ad is viewed (i.e. not when skipped over); whereas, Facebook typically charges a rate based upon impressions. For users to watch advertising video on Facebook they have to be logged, but with YouTube they do not. On YouTube ads are placed in-stream (i.e. ads play before a chosen video starts), but they also offer opportunities to pace static banners as overlays on or beside a random video. Facebook is tops for selecting keywords & demographic target information in order to ensure the video reaches the best audience. Top 10 Reasons Your Business Needs Video And YouTube! Leverage YouTube and Video Content For Business! Websites offer a wealth of detailed and specific information about your business; in fact, a website is your online brand! ; however, in the end does it really matter how new clients find your business? Whether it’s the discerning buyer who reads through the website or a Facebook oriented person; maybe they come via a Yelp listing or a friendly referral that simply calls? Depending on their needs or interests or even if they only want a quick phone number, does it really matter? Rounding out a web presence with lots of citations (=your business information on other websites) is important. It is if you wish to be more visible to more prospects and more potential new business. So let’s talk about why a YouTube channel and video has become so important to your competitive presence online. In fact, leveraging video content and YouTube has huge potential as a business driver! A reason for concern can be the non- channel videos shown to a visitor on the right side of a Youtube’ channel page. There may also be some advertising there as well. It’s the cost of FREE, but a paid option is available to rid of these potential distractions. There are other video host aggregators out there too, some dedicated to particular industries or locations and even those strictly paid with no advertising; however, it’s unlikely any of them will ever touch Youtube’s traffic potential for your business. https://www.kineticknowledge.com/wp-content/uploads/2015/08/kinetic-knowledge-logo2.png 304 300 Kinetic Knowledge https://www.kineticknowledge.com/wp-content/uploads/2018/08/KKLogoDarker-1.png Kinetic Knowledge2017-06-26 12:23:262018-06-26 19:00:03Top 10 Reasons Your Business Needs Video And YouTube! Based upon the number of visitors and pageviews, YouTube is the 2nd most trafficked website online to Google (see top website traffic here). That’s right, YouTube gets more traffic than Facebook! And, by the way, Google owns YouTube so we can be certain its’ video content has favored, if not prioritized, visibility in Google search result pages. Education is one of the major reasons people visit YouTube and that’s not just a trend; it is an opportunity! Marketers (= you!) can leverage the vast interest in education for branding, traffic and new business leads. How? Whether it’s a clever advertising campaign of pre- roll video or a branded video education channel full of content, there is a qualified audience here for the taking. After all viewers are searching information every day on virtually all subjects and YouTube offers inexpensive targeted ad’ campaign and free video channel options. In the latter option mentioned, often referred to as “edutizing“, a marketer can build its’ helpful brand amongst the most qualified potential prospects with a channel full of useful answers to their common questions. In the former (pre- roll advertising campaign) example, an advertiser can easily target those qualified searches by presenting their brand value in quick 30 second pre- roll video ads. How Can Education be Marketing or Advertising For The Average Business? For a business owner, what education supports selling products and services? How about useful answers to common questions that not only inform, but that build trust among the qualified prospects already searching for them. Answers to questions directly related to the products & services the marketer sells? What are the best use options for a fixed amount of space when building a new home? How do you value your home for the property damage limits in a homeowners’ policy? What kind of stretching can be done to relieve lower back pain? What does mold look like or what is the bad mold you need to deal with? How does a local real estate market determine the prices of homes for sale? Wish to talk more about how YouTube can support growth in your business? Whether it’s video ad design, video editing or YouTube advertising campaign management Kinetic Knowledge can help. Give us a call anytime at 732 722 5915 or ask questions here and we’ll get back to you quick!